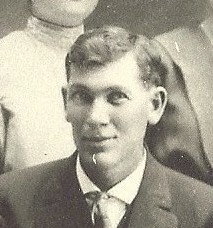 William Jr. first married Etta Mae Wells in 1899. Mae was born on 24 Sep 1879 in Arispe, Kansas, daughter of Thomas Melzer Wells (1842-1933) and Anna B. Allen (1850-1923). After giving birth to Ralph on 1 Nov 1900, Mae died from Cholera on 28 Oct 1901, a short 11 months later. Her death at the age of 22 was a tragedy that could have been prevented with today's medical knowledge. Mae's oldest sister, Annie Wells-Landis, lived with her husband on a homestead in the Oklahoma Territory. In 1901, during a cholera epidemic, Annie contracted the disease and died. By horse drawn wagon, they brought Annie's body from Oklahoma to Wheaton, Kansas, for burial.The trip took several days. Before burial, however, the casket was opened so that Annie's two sisters, Mae and Sarah, could kiss their sister goodbye. That kiss, as you may have guessed, turned out to be the kiss of death. Within a month, both Mae and Sarah died of cholera. Annie died on 9 Sep, Sarah on 13 Oct and Mae on 28 Oct 1901. Etta Mae Wells Clark was buried in the ﻿Pleasant Hill Cemetery﻿ in Wheaton, Kansas. William Jr. next married Edith E. Clark in 1903, daughter of Edward D. and Haidee L. Clark of New York. 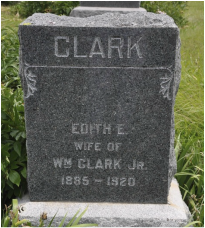 [I couldn't find any close relation since these Clark's were from upstate New York] Edith was born on 1 Jun 1885 in Manhattan, Kansas, and died on 21 Aug 1920. She is buried in the Fox Cemetery in Wheaton. 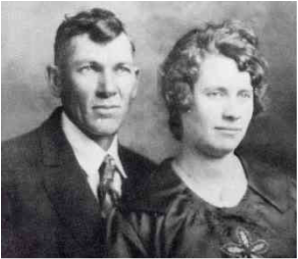 William Jr. next married his cousin, Bertha Neely in 1921, daughter of William and Maggie Neely of Rock Creek township, Pottawatomie County, Kansas. Bertha's father, William Neely, is Jane and Mary Neely-Clark's brother. Wm. 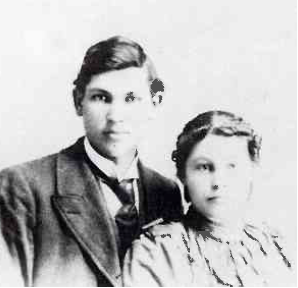 Jr. and Bertha had two children, Arlene (1922-?) and Wilfred (1924-?). William Clark Jr. passed away on 7 Nov 1965 at St. Francis Hospital in Topeka, Kansas. He is buried next to Bertha at the Fox Cemetery in Wheaton. Obituary from the Onaga Newspaper: William Clark, Jr. son of William, Sr. and Jane Clark, passed away after a brief illness, at St. Francis hospital, Topeka, KS on Sunday, November 7, 1965. He was born May 10, 1878 in the Arispie neighborhood, Pottawatomie County. He took pride in relating his age of 87 years to his many friends who realized his activeness. He was united in marriage to Bertha E. Neely, February 15, 1921. To them was born a daughter, Arlene, and a son, Wilfred. Will or “Bill” as he was known to his many friends, was noted for being happy; getting the most from life; showing his loyalty to friends, and his sincere love and interest in his family. He had spent years as a farmer and stockman in Pottawatomie County before moving To Topeka in1948. Preceding him in death were a son, Ralph, in 1951; his parents: three sisters, Mary Cornelius, Bessie Mack and Isla; two brothers, John and James. One of his pride and joys was the presence of his grandchildren, Janice, Marilyn, Dean, Nancy, Evelyn, Max, Chet, Connie, Barbara, Shirley and Ivan. Those remaining of his family to suffer his loss are his wife, Bertha, and a daughter, Arlene Bernhardt of the home; a son, Wilfred and family of Wichita; his brothers, David, Onaga, Cecil, Pomona, CA; Arron, Topeka, his sisters Agnes Canfield, Topeka, Mabel Cornelius, Westmoreland; Pearl Fredrickson, Henderson, Nevada; his grandchildren; 33 great-grandchildren and one great-great granddaughter. Funeral services were held at the Wheaton Congregational Church at Wheaton, KS, on November 10, 1965, with the Rev. Moorman R. Work of the Oakland Christian Church, Topeka, officiating. The body was laid to rest in the Union Ridge Cemetery. Mrs. Vivian Harrington was pianist. Pallbearers, old friends of the family were: Leo Orsborn, Cloyde M. Henderson, Roy R. Pfrang, John W. Zabel, Don Reves and Raymond Reves.